Have you been having a hard time finding 37" inseam pants? I totally understand. Long legs are beautiful, but searching for clothes to cover them can definitely be quite frustrating. Fortunately, I've come across several good stores that sell the length you need, giving you a wide selection of both casual and dress pants in a variety of styles and designs. Below, I've picked out some 37" inseam pants that are popular, fashionable choices. Check them out and see what you think. If you want to dig into your options even further, keep scrolling and you'll find my store list. These are the shops that carry the length you need. Their in-stock items change throughout the seasons, so check back often! 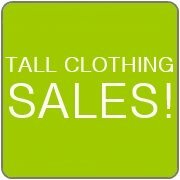 TALL TIP: Alloy Apparel is offering Free Shipping on orders over $85! They have a collection of 37" inseam pants you'll want to check out. Alloy Apparel ($) will be your best bet for finding 37" inseam pants. They have a fairly big collection in this length. Their clothing does come in juniors sizes, but that doesn't mean you have to be a junior to wear them. I think most of their styles would look great on women of any age, so be sure to give them a try. You'll get free shipping on any order over $100. Long Tall Sally ($$) typically has a decent number of pants in a 37" inseam, mainly in their Allegro line. Most other bottoms are in 36" and 38" inseams. This is a tall woman's specialty store with the largest variety of tall clothing out there, so you'll probably want to check out their other categories as well. LTS has a few retail locations in the U.S., Canada, and the U.K., but you'll get the most options online. Free shipping over $30! Gap ($$) is a popular brand and one I'm sure you already are familiar with. When searching for pants and denim, their bootcut styles are the ones that come in a 37" inseam, other styles are shorter. Find something you like and you get free shipping on any $50 purchase. Simply Tall ($$) is a specialty shop for tall women. While not as well known, they do have a good collection of pants in the length you need in casual, dress, and active styles. JCPenney ($) often has a small selection of 37" inseam pants that you may want to take a look at. Unfortunately, you can't shop by inseam so you'll have to go through each item to find out the inseam measurement.